When I first read the title of this book, I thought it would be a comprehensive “how to” guide for people learning how to edit, like The Copyeditor’s Handbook by Amy Einsohn. The focus of this book is somewhat different. The Editor’s Companion is aimed at professionals who already know something about communications, but are early on in their careers as editors. Dunham has more than 30 years of writing and editing experience, and he shares his experience on critical topics to help other editors understand the role and avoid some common pitfalls. The strength of this book lies in Dunham’s descriptions of his personal editing experiences. He includes many examples from documents he has edited and often points out alternative solutions. I particularly enjoyed his chapter on “Editing for Precise Language,” which includes thoughtful insights on accuracy, word choice and proper attribution. Dunham also talks about practical tips and tricks, such as identifying a list of “bad words” that are difficult to spot (like mange for manage). He provides a copyediting and proofreading checklist and a list of helpful resources. In addition to his detailed thoughts on copy editing, Dunham touches on topics relating to substantive and stylistic editing, such as knowing your audience and focusing on the subject. I found these sections to be a little thin on content. Dunham provides many quotes here from other expert sources; I would have preferred to hear more about his own thoughts and approaches. The book in general is organized as a collection of short observations on specific topics of interest, which sometimes affects the coherency of the overall narrative. Dunham ends the book with the chapter “The Ones That Got Away,” where he provides many fun examples of editorial misses (like the ones Editors Canada calls out every year for our Oops Awards). Dunham displays a great sense of humour in this chapter. If you’d like to see more of these gaffes, he writes about them on his Editor’s Companion blog. I believe The Editor’s Companion would be an interesting read for other copy editors, particularly for those working with non-fiction. 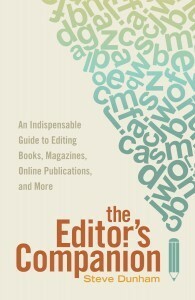 Although this is not a comprehensive guide on all aspects of editing, it works well as a supplementary resource and includes some great advice from an experienced editor. If you have read this book, what did you think? What would you recommend as an editing resource for new editors? This book was provided to The Editors’ Weekly free of charge by the publisher. Neither The Editors’ Weekly nor the reviewer received any compensation for this review. The opinions contained in this review are those of the reviewer alone and were written free of any obligation or agreement with the publisher. Sue Archer’s official job title keeps changing, but she remains an editor at heart. During the day, she helps people from different worlds (business and technology) communicate with each other. At night, she writes communication tips on her blog Doorway Between Worlds and edits self-published fiction. Maybe someday she’ll finally get the time to write that novel. 10 Responses to "Review: The Editor’s Companion by Steve Dunham"
I’d like to have heard more about his thoughts on stylistic and substantive editing. This blog is moving more and more towards copyediting topics, and this gives the wrong impression about what editors do. As Rosemary Shipton wrote in a couple of other blog entries, we do all sorts of things beyond standardizing and correcting spelling and punctuation. Hi Anita, thanks for taking the time to comment. I agree that editors perform a variety of critical tasks. I would have liked to hear more about substantive and stylistic editing in this book as well. There is a chapter that discusses audience and market considerations and the importance of plain language. Most of this chapter consists of references to other sources rather than details about the author’s own experiences. There is also a very short chapter (six pages) on writing strong openings and closings and sticking to one subject. Overall substantive and stylistic content represented a small portion of the book, with the majority of the content focused on copy editing. I find that substantive and stylistic editing are not well represented in a lot of editing resources, which is unfortunate. If you know of a good resource, I would love to hear about it! Stet by Diana Athill isn’t a how-to book, but it describes some of the work a substantive editor does (or did in the pst) – in this case with literary giants such as Mordecai Richler and Philip Roth. Most of us don’t get to do that stuff! Thanks, Anita! It sounds like a fascinating read. Two books published by University of Chicago Press analyze structural (substantive) editing in detail: Joseph M. Williams, Style: Toward Clarity and Grace , and Scott Norton, Developmental Editing: A Handbook for Freelancers, Authors, and Publishers. They are both quite dense, so, as Anita says, the memoirs by the “great” English and American editors make for easier, though hardly comprehensive, reading. The challenge in writing about substantive / stylistic editing is that every case is different, so it’s difficult to generalize. It’s so much easier to prescribe “rules” for the more mechanical copy editing or proofreading. As an instructor in these areas, I find that EAC’s Meeting Professional Editorial Standards guides to both substantive and stylistic editing are the most useful sources available for people trying to learn these skills. Once they have worked their way through the various annotated exercises, they should be ready to begin applying their natural talent to the texts they edit. I agree that substantive/stylistic editing is difficult to codify into rules, and requires a different approach. Thanks for all the great resources, Rosemary! Yes, I think the operative words are “natural talent.” People have also talked on this blog before about the importance of editors reading widely, not only to better understand the topics they edit, but also to become more familiar with excellent writing styles. I’m rather late in joining this discussion, but I’d like to mention that Steve Dunham does not subscribe to Editors Canada’s standards of editing, and that maybe we can’t criticize him for that. Toward the end of his book, he mentions that there are five editorial tasks: substantive editing, copy editing, technical editing, proofreading, and quality checks. What I would like to have seen is more explanation of these stages or types of editing. As everyone has mentioned, the book concentrates on copy editing. The main problem with the book is poor organization — it needs a substantive edit! For my review, see editorsreads.me. I’m afraid I’ve been less generous than you, Sue. Ellie, thanks for joining the conversation. I read your review, and I think you’ve done a fair job outlining the weaknesses of the book – the over-reliance on quotes and the lack of coherency. I agree that a better substantive edit would have improved the book. I found enough value in the book to balance these shortcomings, but I can certainly see your point of view. Thanks for commenting! “It needs a substantive edit.” True, I believe of too many books. They are handed to a copy editor, and every comma is used correctly, but it’s still not a good book.